gives the loft extreme support and stability. 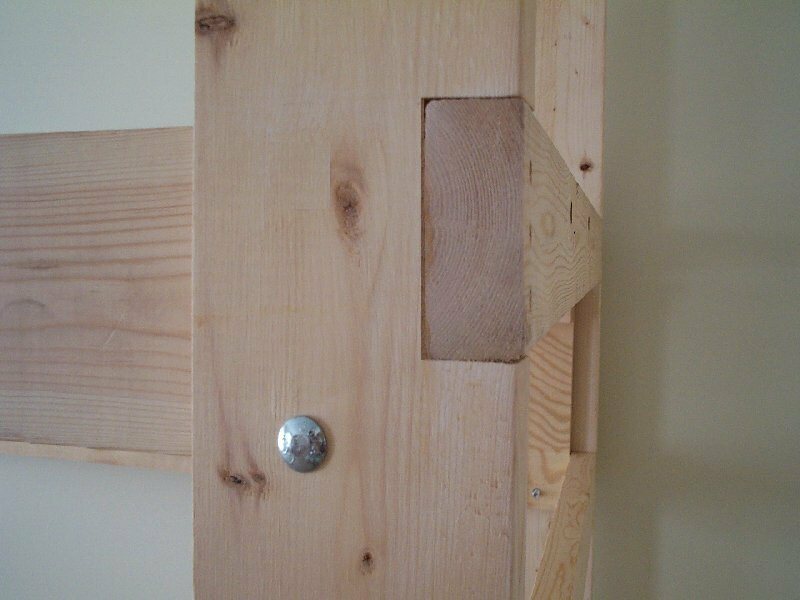 End ladders are (notched), screwed and bolted to the bed rails. The loft is assembled with screws and 3/8 in. carriage bolts, no nails that will come loose over time. Single, Double Bookshelves and other options are available for all the Loft-Bed Sizes. Lofts are made from kiln-dried unfinished hardwood (Premium Douglas Fur) construction grade dimensional lumber, typical of what you would find at a Home Depot, Lowes or local lumber yard. The legs are 2x6, front rail is 2x6, back rail is 2x6 ladder rungs are 2x6, safety rail is a 2x6. Four (4) bed slats are provided with each loft. You can purchase more separately by choosing the additional weight capacity option at checkout. The loft may be painted, some sanding may be necessary. We do recommend painting or staining the loft as unfinished softwood will absorb moisture. Note: Mattress are not included in the price, but you may purchase them from us. Our loft can be disassembled and reassembled many times without any issue.